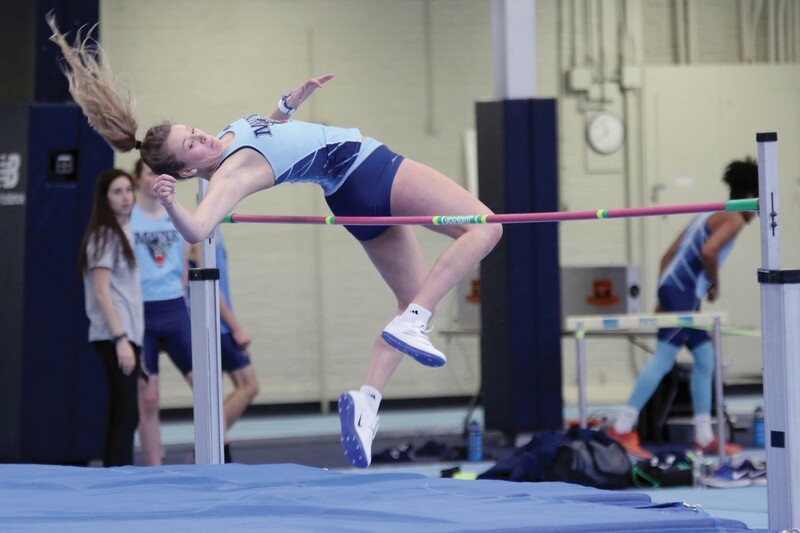 The University of Maine men’s and women’s indoor track teams competed for their first meet of the season on Saturday, Dec. 1 in a home meet held at the Memorial Gym. The teams worked hard, but fell to the University of New Hampshire Wildcats. The men’s team combined to score 89 points to UNH’s 99, and the women’s team combining to score 83 points against the Wildcat’s score of 94. Saturday’s meet was the first of two times this indoor season where the Black Bears will compete against the Wildcats. Third-year Ariel Clachar brought in the first points of the meet for the women’s team, winning the long jump with a jump of 5.61 meters. Second-year Anna Shuman won the triple jump, with a jump of 11.25 meters. First-year Brianna Ewing brought in five points with a time of 9.15 seconds in the 60-meter hurdles. Second-year Cassidy Hill won both the 60-meter hurdles, finishing with a time of 7.82 seconds, and the 200-meter dash, which she finished in a time of 25.71 seconds. Fourth-year Hayley Lawrence won the 3,000-meter run with a time of 10:44. The women’s 4×400 relay also took a top finishing spot. The winning team, made up of fourth-year Lauren Magnuson, second-year Brittany Torchia, Hill, and first-year Samantha Sudol, finished with a combined time of 3:57. The first win for the men’s team came after first-year William Green won the pole vault, vaulting a height of 4.25 meters. He was closely followed by a win from second-year Troy Davis, who won the men’s high jump after jumping a height of 1.98 meters. First-year Elijah White won both the long and triple jumps, with jumps of 6.8 and 14 meters, respectively. Fourth-year Kelby Mace brought in second place for the Black Bears in the 60-meter dash with a time of 7.08 seconds. He was accompanied by first-year Ethan Orach, who brought in second place in the 800-meter run, with a time of 2:00. First-year Travis Nickerson was also awarded second place in the 1,000-meter run, after bringing in a time of 2:38. He was closely followed in the event by teammate second-year Cooper Nelson, who finished third with a time of 2:44. Fourth-year Aaron Willingham finished the 3000-meter run with a time of 8:34, which was almost 30 seconds ahead of the second-place finisher from UNH. The men’s 4×800 relay team, comprised of Nickerson, first-year James Oliver, Orach, and second-year Colin Tardiff, won the event with a time of 8:17. The only Black Bear to place in the heptathlon, which is comprised of the 60-meter dash, long jump, high jump, and the pole vault, was third-year Cam Cleathero, who took home first place. Although this was their first meet of the indoor season, the Black Bears have been preparing all year. “I love the atmosphere of the team. Whether it’s before a lift or after a practice, they’re always having fun. But everyone knows how to put the work in, and everyone is super welcoming, we do team events, it’s super fun,” Zack Westman, a first-year, said. “I think being on this team is really great, we’re all really supportive of each other,” Christensen said on Saturday. “I’ve been on the team four years, I’ve done every season. I think as a captain, personally I’ve seen a lot of the girls grow. My freshman year, there was some distance. But, being a senior, I’ve noticed the whole team bonding aspect, and growing really close this year, that’s been really exciting to see. We’re all just really supportive of each other,” Lawrence said. The Black Bears were well prepared for their first meet, after working hard throughout preseason. They also have a goal set: make it to the America East Championship meet. “I’m really excited for America East, the last meet of the season where we race against everyone in our conference. It’s kind of a big meet, a lot of adrenaline, it’s what we work towards each year,” Lawrence said. Cleathero noted that Saturday’s meet helped Black Bears get a feel for the season. “It’s more of just a shake-up today, the first meet of the year. It’s not really competitive, it’s more just getting into it and starting up again,” Cleathero said when asked how he felt about going up against rivals UNH. Although Maine was unable to take a win away from the first meet of the season, they are prepared to work hard and plan to improve as the season goes on. Their next meet will be in Hanover, New Hampshire, as the Black Bears will be competing against teams from Dartmouth and the University of New Hampshire.